One of the most difficult things about writing is avoiding distractions. Sometimes the lure of social media is too strong to resist. For instance, while writing this blog post, I had to really force myself to concentrate on the task at hand instead of compulsively checking Twitter, Facebook, and Pinterest. I’ll be the first to admit – it’s tough to focus. Of course, the Internet is not the only evil in the world. When it comes to writing, you can also be distracted by a myriad of nuisances, such as pets, friends, family, the telephone, the television, and sometimes even the weather. 2. Block all time-wasting websites for the duration of your session. If logging out of your accounts isn’t enough to deter you, download an app such as StayFocusd or Strict Workflow for Chrome, Leechblock for Firefox, SelfControl for Mac, or even Cold Turkey. Once you’ve discovered your demons, add them to the lists of sites to block, set a time to block, and let the program do the rest for you so you can focus on writing. 3. Turn. It. Off. This tip applies mostly to the computer but can be extended to all manner of technology. If you don’t need it to write, power it down. If you write with pen and paper, you should be nowhere near your laptop. It shouldn’t even be on. If you use a word processor, go ahead and write on your computer – just make sure to switch off your wifi. That way, if you’re tempted to access the Internet, you’ll feel guilty when you see that you’re unable to connect. Sure, you could flip the switch back on just as easily, but for most cases, turning it off should be enough to stop you. The same goes for your cellphone – turn it off or silence it. Let everyone know how long you’ll be working and tell them to leave a message if it’s anything important. I promise you the world can do without you for an hour. 4. Write or Die. No, I’m not just being dramatic. Write or Die is a life-changing webapp that encourages you to reach a custom word count in a certain amount of time; say, fifteen minutes. If you slack off and stop typing for a long, the program punishes you with an unpleasant noise (such as “Mmmbop” by Hanson) and a bright red screen. Honestly that red screen scares me more than anything. I usually set my word count at 1,000 and the time period for an hour. I’m always amazed by how much I manage to accomplish. Check the program out. 5. Play some music. This tip isn’t for everyone, but I’ve found that tuning into Pandora’s “Classical Music for Studying” really does wonders for my productivity. If classical music isn’t your thing, try to stick to some kind of music without lyrics for maximum concentration benefits. There you have it: a few simple solutions to help you overcome distraction and make some progress with your project. Once you’ve made some headway, feel free to reward yourself with a social media or texting break. After all, you deserve it. Just make sure not to cheat and reward yourself early! What do you think of these tips? 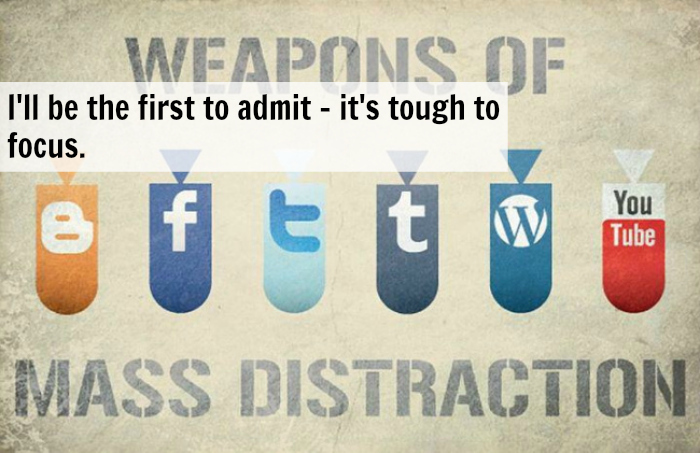 How do you avoid distractions?